Watch Aimee make this tasty dish! 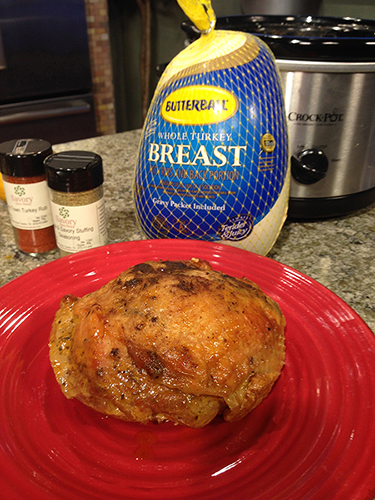 If you are looking for a way to make a smaller turkey this Thanksgiving, try cooking a turkey breast in your crock pot! It will be moist and delicious, not to mention, oh so easy! Remove turkey breast from packaging and pat dry with paper towels. (Make sure you thoroughly wash any surfaces where raw turkey comes into contact; counters, cutting boards, sinks, etc.) In a bowl, combine softened butter and seasonings, mixing well. Add the juice from a lime, and stir all together. Using your fingers, rub this mixture all over the turkey breast, making certain to get underneath the skin. (A good way to remember this during the holidays is, if your in-laws get under your skin, you will remember to rub this herbed butter mixture under your turkey skin!) Rub this mixture all over the turkey, under the skin, then place the lime halves on the inside of the turkey. Place the turkey breast into your crock pot, then add the wine or cava. Cover and cook on low for 7 to 7.5 hours. If you are able to, throughout the day (or night), spoon the butter/wine mixture over the top. This mixture makes a delicious gravy for your mashed potatoes!